Without question, the whitetail deer is the most pursued big game species within our provincial boundaries. Wide spread populations, vast habitats and promising hunting opportunities have all been attributed to elevating their pronounced popularity. They inhabit a wide variety of complex environments that range from the sporadic bluffs of our southern prairies to the dense forests of our remote central landscapes. 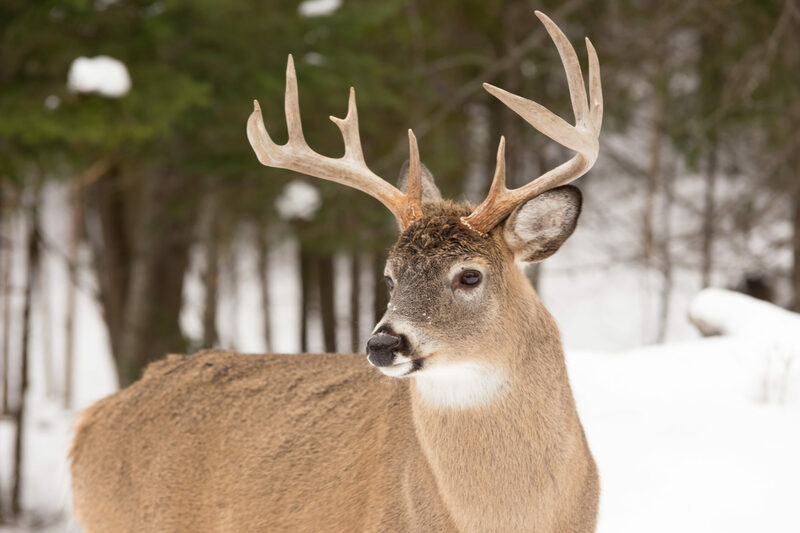 Manitoba’s whitetail offers one of the most diverse hunting experiences available and is well known for producing massive dark antlers and often tipping the scales at 250 pounds. The sight of a huge buck suddenly appearing before you is a captivating occurrence that has easily humbled the most dedicated whitetail follower. Witnessing the presence of such an animal is an accomplishment in its own right and one that regularly requires a tireless pursuit from sun up to sun down, on the coldest of days. Giant whitetails are masters of their surroundings, they methodically maneuver without detection and exercise a talent to hear, see or smell you from a mile away. They are arguably the most elusive big game animal in North America! Whitetail Deer hunts are popular in areas of the Parkland, Western, Central Plains Pembina, Interlake and Eastern Region. Depending on the Game Hunting Area (GHA), hunting season dates are primarily during the months of September through December. For more information on Game Hunting Areas (GHA’s), season dates, resident, non-resident & foreign resident Whitetail Deer licenses or additional information on hunting in Manitoba, please visit the Manitoba Conservation website or refer to the current Manitoba Hunting Guide.